SUMMIT POINT, W.Va. West Virginia — On a clear, sunny Wednesday morning, Lt. Col. Jorge Dolmo stepped up to the firing line and began to shoot. Three shots, reload, repeat. Reload. Three shots. Reload. Three shots. Reload. Dolmo and his fellow trainees ran the drill over and over on their M9 pistols, practicing quick magazine changes and "tap and rack" drills to clear a malfunction — all while under the watchful eye of their instructors. The lessons were simple, but potentially life-saving. Every one of the men and women on the firing line that day are headed to overseas to hotspots in troubled places countries like such as South Sudan, Liberia, Mali, the Central African Republic and the Democratic Republic of Congo. Their mission: to support United Nations peacekeeping efforts missions. 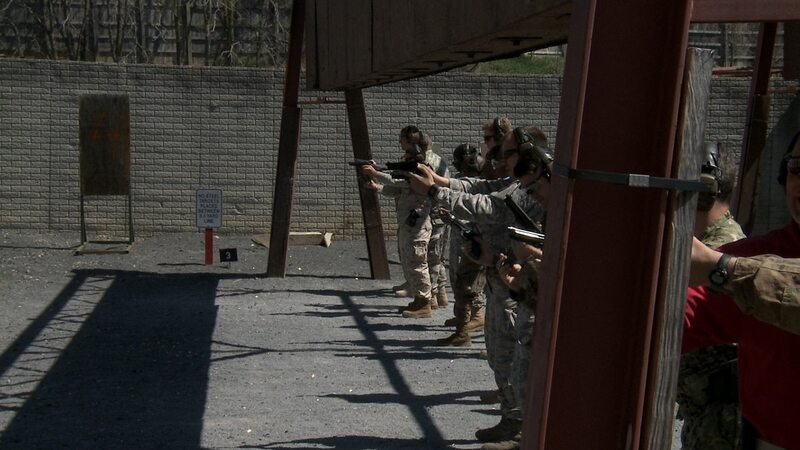 To prepare, they spent six days — part of an overall 28-day training regimen — here at Summit Point Motorsports Park receiving firearms training as well as intense lessons on defensive and evasive driving. "This is outstanding training," Dolmo said. "My only regret is this wasn't training available to me as a young lieutenant." Dolmo, a logistics officer who is going to serve a six-month tour as a logistics planner in Mali's capital of Bamako, said he's looking forward to deploying with the United Nations. "It's going to be a different challenge for a lot of us in the military because we're not used to the UN, but just like everything else, we'll adapt," he said. "I've never been to sub-Saharan Africa. It's going to be pretty cool." The U.S. Military Observer Group, which is run by the Army, is responsible for training American U.S. service members deploying to support UN United Nations missions. The U.S. military fills about 40 positions in various UN missions, and they serve either as military observers or as staff officers, said Lt. Col. David McGurk, the U.S. Military Observer Group’s chief of operations. The troops go on to serve in Israel, Central African Republic, Mali, South Sudan, Liberia, Haiti and the Democratic Republic of Congo, McGurk said. 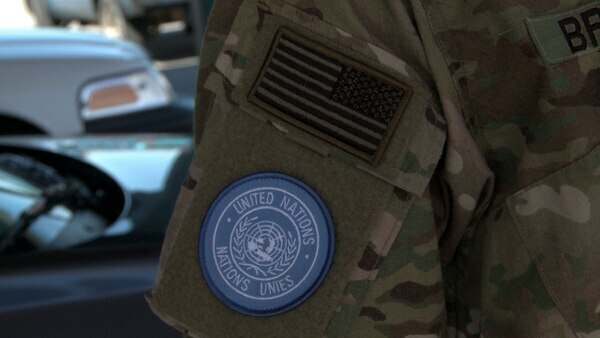 Once overseas, they troops take pains to integrate into the international governmental organization's UN mission, including wearing the blue UN nited Nations patch on their right sleeve. Military officers serving with the United Nations wear the governmental organization's distinctive blue patch. The U.S. Military Observer Group also supports three American officers working at UN headquarters in New York City. Most of the deploying troops are captains, majors and lieutenant colonels, and those the ones preparing to go to overseas are given the 28-day predeployment training. The training is conducted twice a year, usually in April and October. This latest April class has 26 officers — 11 from the Army, seven from the Marine Corps, six from the Air Force and two from the Navy. "There are a lot of requests for peacekeepers, but there isn't a lot of peace breaking out in the world," McGurk said. "This gives them some foundational training. If they're out there on their own … and there's a threat, they can evade it." The goal of the six-day training here at Summit Point, which is led run by civilian instructors with BSR Inc., is to equip deploying service members with basic driving, firearms and first aid skills, especially as they likely will be operating in small groups with little to no force protection support. A driver performs a barrier breach at the Summit Point Training Center in West Virginia. The training prepares U.S. troops deploying to participate in United Nations peacekeeping missions around the world. The instructors with BSR work to tailor their training for each class. "We get every skill level, so we try to balance that and find that happy medium," said Larry Connolly, the chief firearms instructor for BSR. "We have officers from all walks and backgrounds, so we start with the basics and work our way up," he said. The tailored training also helps the officers prepare for whatever they might face, McGurk said. "The threat around the world is always changing," he said. Chris Otto of Summit Point Training Center in West Virginia gives Army Times editor Tony Lombardo a taste of the training that will help keep officers safe in United Nations missions abroad. Lt. Col. Ben Sunds trained alongside Dolmo in April. A civil affairs officer, Sunds is also going to Mali, where he will be the civil-military section chief for the UN brigade in the city of Gao. "The training has been good," Sunds said. "No matter how many times you've done this, it's perishable. We all always have the right to protect ourselves, and it's not that you're expecting trouble, but that you're prepared." Marine Maj. Liliana Molina, a ground supply officer, volunteered for her upcoming deployment to South Sudan. She said she especially enjoyed Her favorite part of the training here was the firearms training, she said. "We got to do different drills that I hadn't had a chance to do before," she said. Molina said she volunteered for the UN deployment for the chance to work with troops from other militaries. These UN deployments are valuable, broadening experiences, said Lt. Col. Mark Loyola, who is halfway into his 12-month deployment as the senior U.S. military observer in Mali. "For one thing, there aren't that many Army personnel that do have the UN experience," Loyola said. "It's definitely something outside of the [Iraq and Afghanistan] model that I was accustomed to. This was a way to gain another perspective in regards to not only warfighting, but, in this model, about peacekeeping." He also has learned a lot about how other armies operate, Loyola said. "For me, it's about developing professionally and to have different perspectives," he said. "I would definitely recommend serving on a UN mission."